Jim claimed I could buy Italian ice anywhere in New York. He said during the summer there’d be pushcart vendors on every street corner. We booked a hotel in Chelsea. I walked the Great Hot Way up to Central Park, took the escalator from the posh ground-level Columbus Circle Whole Foods up to even posher doors leading to Per Se and Masa. I gazed at the marvels of the Big Apple and hiked back, all the while hoping to find Italian ice. On the sidewalks of New York I didn’t find one pushcart selling paper cups of granita or sorbetto italiano. 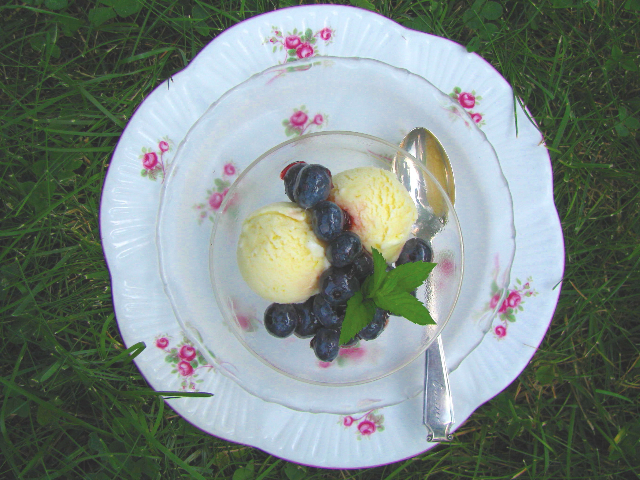 Back home I pulled out my Ballymaloe lemon ice cream recipe, tweaked it for tartness, and made the frozen treat myself. This summer dessert—actually an ice milk—uses less sugar than a classic lemon ice or sorbet, with the sweetness of the milk tempering the lemon. It’s almost an instant whip-up with a farm-fresh raw egg. It freezes quickly in an electric ice cream machine or a manual Donvier. It may also be still-frozen in a plastic bowl or glass baking dish with a stir every half hour or so to prevent large ice crystals from solidifying. If you want a softer, easier-to-scoop ice milk, add a soupspoon of vodka or tequila to the mix. A little lemon ice milk melting over a bowl of blueberries or sliced peaches will seduce even the confirmed chocoholic. Wash and dry the lemon. Use a microplane or fine grater to remove the yellow zest. Rub the lemon zest into the sugar with your fingertips. Squeeze the juice from the lemon; there should be four to five tablespoons. Whisk the lemon sugar into the egg yolk. Blend in the lemon juice. Stir in the milk and optional cream. With a clean whisk beat the egg whites to soft peaks and fold into the lemon milk base. Taste for sweetness and freeze in a small ice cream maker or still-freeze following suggestion above. Makes about one pint. We sat on wooden school chairs at a cluttered desk. We rolled back the lid from a tin of anchovies and twisted open a jar of marinated artichokes. We broke crusty rolls and ate a legendary Italian lunch. In that college room years ago, I tasted anchovies for the first time and marveled at what lay beyond the Colorado River. Anchovies are magic food. They’re a natural flavor catalyst. Despite their current bad rap, these salted miniature fish enhance seasoning and endow cooking with umami—the fifth taste beyond sweet, sour, salt and bitter. The Japanese call umami “deliciousness”; it’s often replicated with the chemical monosodium glutamate. Anchovies were essential to the ancient Romans in their garum sauce, and today anchovies flavor hundreds of different Asian fish sauces, plus some common condiments. 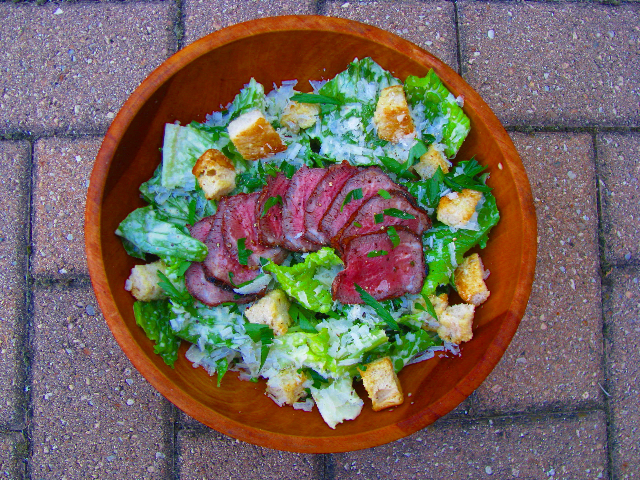 The Caesar Salad, historically created by Caesar Cardini in Tijuana, Mexico, may not have originally included anchovies. It did, however, call for Worcestershire sauce, which contains the subtle glutamate flavor of anchovies. For me the best Caesar Salad has real anchovies, no anchovy paste, no Worcestershire—only the amazing combination of lemon, olive oil, garlic, Parmesan and of course anchovies. Another part of the dressing, the egg, should be fresh, organic or free-range if possible. When the egg is briefly coddled or boiled just under a minute, it firms up slightly. The egg, also “cooked” by the lemon, gives the dressing a creamy texture with far fewer calories than more oil. A Caesar Salad makes a meal in itself. With the addition of grilled steak, chicken or eggplant, it’s a summer feast. To coddle the egg: bring a small saucepan of water to a boil. Lower the egg into the water and let it cook 45-60 seconds. Remove egg to a bowl of cold water and proceed with the recipe. Crush the garlic with the salt in a small mortar or on a wooden board using the tip of a chopping knife. Add crushed garlic, sliced anchovy fillets, lemon juice, mustard, Tabasco to a blender jar and whiz to combine. Crack egg at the equator, scoop all the bits into the blender jar; blend again. Add olive oil and blend just to combine. Pour dressing into a glass jar, add 1 tablespoon water to blender jar, swish thoroughly to rinse contents and add to dressing. Stir to combine; chill until ready to use. The dressing may also be mixed in a bowl. Mash the garlic with the side of a knife and the anchovies with a fork. Place in a bowl with the coddled egg, mustard and whisk in the lemon juice until well combined. Stir in olive oil to emulsify, and season to taste with Tabasco if desired. For a traditional Caesar salad, mix crisp Romaine lettuce with the dressing, garnish with toasted croutons, shaved or grated Parmesan cheese, and freshly ground black pepper. Makes enough dressing for a whole meal salad for 2 or a side salad for 4. ﻿ I fancy a summer in Santorini: I arrive by boat and walk up the five hundred and sixty-six ancient stone steps from the port to the town. I wear a wide sun hat and carry a backpack stuffed with books. I live in a whitewashed cottage with tile floors and a view of the sea. I stop in a nearby café for sticky dark coffee, buy olives and grapes in an outdoor market, and light pencil-slim beeswax tapers planted in a bowl of sand in a tiny stuccoed chapel. I can all but feel the Mediterranean heat and smell the wild sage. Still, my Aegean island daydream finds me on my Midwestern back patio, where pink geraniums bloom next to a bird bath, and Kentucky Wonders climb over a wire fence. An Iris Murdoch novel waits on a shaded chair while eggplant from the farmers’ market and lamb kebabs from Sugar Valley sizzle on the grill. We’ll have honeyed warm figs with lemon ice for dessert and, to begin our island sojourn at home, a Greek Watermelon Salad. 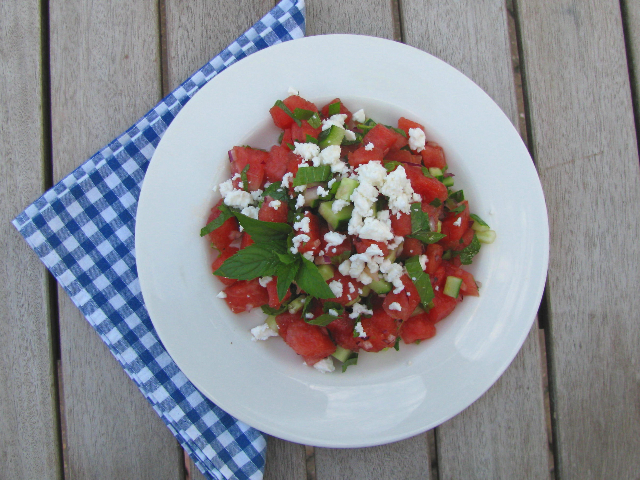 Watermelon salad is the classic combination of salt and sweet. Colorful, light, cool, it’s irresistibly summer. The next time you have watermelon left after a beach picnic, dice up a segment for a salad. In a large bowl combine the watermelon, cucumber, onion and mint. When ready to serve, drain any accumulated juice, drizzle with lemon juice, olive oil; sprinkle with a little salt, and mix gently. Heap the salad on individual plates or in a serving bowl. Crumble feta over the top. Five years ago I learned the in-depth details of celiac disease, the body’s inability to metabolize wheat gluten. I thought it was a relatively new discovery, but the malady was recorded in ancient Greece. I still wonder how it develops and where it is going. After all, “bread” has meant food, the staff of life, for longer than recorded Western history, for as far back as early man crushed grain into meal and baked flat unleavened cakes on hot stones. What’s happening to us and to our wheat? Have we genetically modified our grains until they are less digestible? Have we tangled our ourselves with too much stress and too many additives until we’ve compromised our natural systems? Have we become incompatible with certain foods? It’s a mystery, but we know that some people simply cannot tolerate wheat gluten and many others can eat only small amounts. Let’s look at what the celiac can have, rather than lament the loss of bread, cereals, pasta, crackers and cakes as we’ve known them. There’s a long list of nutritious gluten-free grains ground into flour and readily available. We have brown and white rice flours, corn starch and corn meal, buckwheat flour, sorghum flour, bean flours and tapioca starch, to name a few. Granted, none of these flours develop elasticity when combined with liquid. However, we have the magic of xanthan gum, fermented from glucose, or guar gum ground from cucumber-like seeds. Both these gums, used in minute quantities, cause gluten-free flour to develop a thickening stretch. It’s bread of a different flavor and a different look, but when it’s crisped in the oven or sliced and toasted, the celiac again can enjoy bread. Soften dry yeast in lukewarm water adding a pinch of ginger. Combine the flour mix, salt, sugar dry milk, xanthan gum and make a well in the center. To the yeasted water add egg, vinegar and oil. Pour the liquid into the flour and beat well 4–5 minutes on and off by hand or 3 minutes in stand mixer. 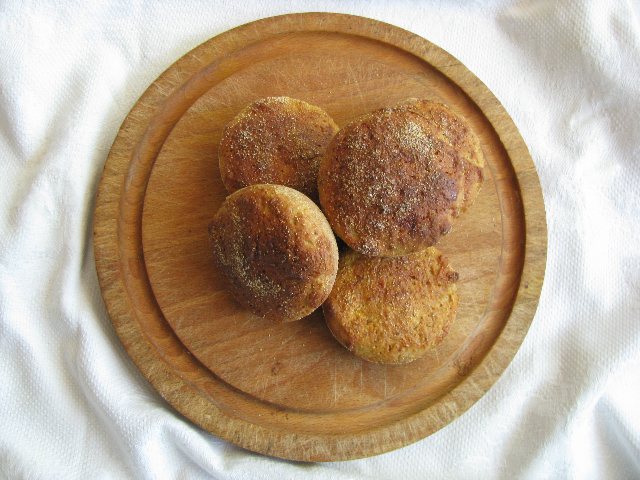 Note: This recipe first developed for use as a gluten-free altar bread breaks easily and does not crumble when dipped in wine. You are currently browsing the Mary Jo's Kitchen blog archives for July, 2010.